The RUIS McGill Centre of Excellence on Longevity brings together health professionals, social services, researchers and public institutions in a transversal organization and pursues its missions thanks to a multidisciplinary team dedicated to supporting the human longevity. 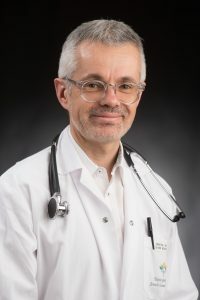 Dr. Olivier Beauchet is certified in neurology, internal medicine, and geriatrics, and assumed the role of Director at the Centre of Excellence on Longevity in June 2016. He is fifty years old and serves as a full-time professor at McGill University and as a consultant geriatrician at the Geriatrics Division at the Jewish General Hospital and holds the Dr. Joseph Kaufmann Chair in Geriatric Medicine. Dr. Olivier Beauchet holds a Master’s degree in pharmacology, a Master’s in neuropsychology and a doctorate of neurosciences. Over a 25-year career of clinical research and practice, Dr. Beauchet has focused on exploring age-related cognitive-motor decline, the neurological effects of vitamin D and treatment pathways for elderly patients. Today, he is one of the world’s leading specialists in vitamin D deficiency, as well as gait and balance-related issues and their relationship with cognitive decline. He is the founder and leader of two consortia, one of which operates internationally, the other throughout Canada, bringing together international teams of researchers and clinicians who specialize in human longevity. Because of the way it attracts and brings together high-level expertise, complementary professional backgrounds, and a variety of different environments, the Centre of Excellence on Longevity is well placed to address all aspects of human longevity. As such, the Centre of Excellence on Longevity involves a community of experts at provincial, national, and international levels, whether on a one-off or permanent basis, with each of these experts providing a complementary perspective and exceptional capabilities in the various specialisms that are involved in the field of human longevity. These experts – including university-based research scientists, lecturers, entrepreneurs, sociologists, nurse, occupational therapists, designers, professional caregivers, communications or marketing consultants, territorial development specialists, geriatric medicine specialists, doctors, home automation specialists, training providers, representatives of elderly people, and politics – come from the a variety of backgrounds such as the university sector, public services, the business world, and the voluntary sector, as well as the wider community. President and Founder of Caregiver Crosswalk Inc.